Our Vignoles IPA, the third release in our gold medal-winning CampusWerks Series, is a true collaboration with St. James Winery. This harvest blend combines our Elusive IPA with freshly pressed Vignoles grapes straight from the winery’s vineyard. It’s incredibly smooth, with aromas of crisp grapefruit, tangerine and pineapple flavors complementing our thoughtful blend of hops. Whether you’re beer aficionado, a wine lover, or both, Vignoles IPA has flavors for you. Aromatic, spicy and hoppy, with notes of orange peel and lemon zest, our Provision Farmhouse Ale has a distinctive dry finish. Deep gold in color, this beer is not filtered so it contains haze from the yeast left in solution. Rustic and artisanal, this beer is a salute to the farmers who supply our Fermentation Campus and kitchen with fresh, local ingredients. Originally brewed to sustain hardworking farmers through long, hot summers, this beer has a higher ABV than traditional farmhouse ales. Whether you've been working your mind or body, Provision will invigorate your senses. After years of researching and developing small-batch beers released only on draft in our Rolla Brewpub, we are sharing our findings in a new line, complete with new packaging. 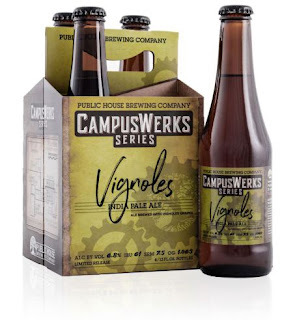 This limited release beer line called the CampusWerk Series gives more people accessibility to flavors only Rolla-area beer enthusiasts previously enjoyed. We released the first of four beers in the series in April. Called Soest Road circa 1995, this beer is a Belgian-style Dubbel coming in at 6.5% ABV. Soest Road is where Public House Brewing Company cofounder Josh Stacy grew up learning about beer and the brewing process with his home-brewing family. This brew galvanized Stacy’s passion for craft beer. Rich and malty, with hints of caramel and dried fruit, he may have polished off an entire keg by himself. But he swears it wasn’t in one sitting. The CampusWerks Series represents the results of an innovative partnership with the brewery’s next-door neighbors at St. James Winery. Combining two award-winning fermentation approaches, we inspire each other and work together to develop flavor profiles in craft beverages that are thoughtful, local and sustainable. Our Fermentation Campus is like a cross between an artist’s workshop and a technology think tank. It’s a place to elevate our thinking and open our minds to new levels of learning and understanding. It’s where research, development, creativity and inspiration flow together into something amazing to drink.